Neo-liberalism is a political-economic theory that places emphasis on free-enterprise, deregulated economy, and an individual and personal right to succeed without a limit. 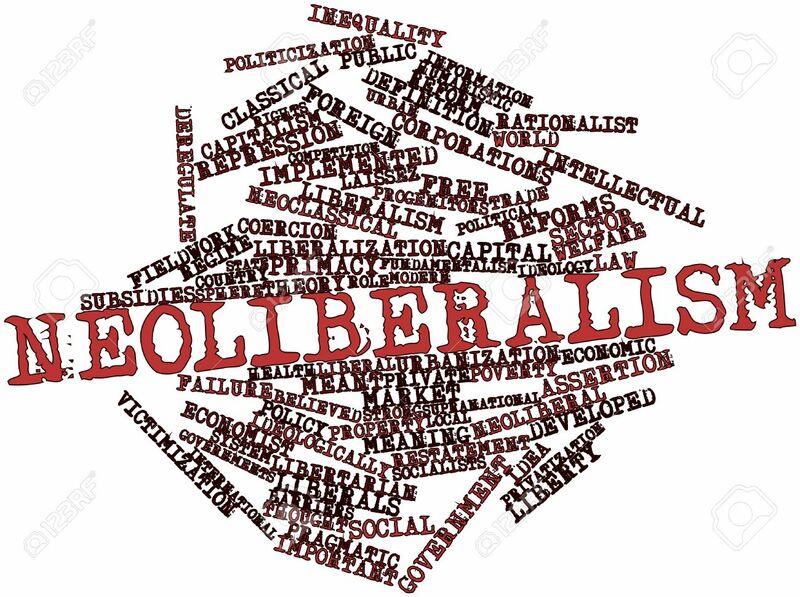 When discussing political theory, it’s important to note that many theories fall under the umbrella of “liberalism.” Modern American conservatism, capitalism, classical-liberalism, consumerism, and may other economic-based political theories originated from liberalism. Throughout American history, political theories often change meaning or adopt new meanings as new issues arise. Political theorists like Adam Smith (a.k.a. the father of modern economics/capitalism) wrote many pieces of literature outlining the role of government in economics and how it interacts with freedom of people. Adam Smith’s liberalism discusses allowing the economy to flow naturally. A common misconception about Smith’s writing is that there should be no government intervention whatsoever, but like other political ideologists like John Stuart Mill and John Locke, he believed that too much power corrupted people and that there must be a check-system in place (like a government) to prevent people from obtaining absolute power. Liberalism in Europe during the 17th, 18th, and 19th centuries centered around free enterprise in the wake of the Enlightenment period, whereas conservatism centered around the Church. In America in the 18th and 19th century, liberalism was about free speech, free expression, and free trade. Liberalism was the dominating mindset of the American South during the slave trade, and soon after during Reconstruction in the era of Black Codes. Liberalism began to take a turn in the early 1900’s when Republican politicians were blamed for the Great Depression in 1929. There was no regulation of the stock market, there were no caps on interest rates on credit, and consumerism was at an all-time high when people began moving out of cities and into suburbs. Liberalism became better understood when John Keynes came up with the theory of liberalism working the best for capitalists when capitalism is regulated. Liberalism gained a new meaning when Franklin Delano Roosevelt became president in 1933. His social programs and security blanket policies reshaped partisan politics and the political spectrum in the US. People who were once Republicans (like African-Americans who were ex-slaves and owed their vote to the party of Lincoln) began voting for Democrats. For the first time ever, black people were voting for the same party as Southern Democrats. Under FDR came the formation of many regulatory agencies like the Federal Deposit Insurance Corporation which ensures that the government will pay people the amount of money they had in a bank if it goes under; the Securities and Exchange Commission was formed under FDR’s presidency which was an agency that created laws and regulations to ensure that the stock market would not collapse due to greed or negligent gambling; the Social Security fund was created under FDR which made sure that retirees had a monetary income when they could no longer work; the Works Progress Administration was a government program that provided jobs to people who studied the arts. There are a number of New Deal programs that FDR created, some still used today, but the point was to make sure that the poor had something to fall back on and that the rich could not capitalize too much on the plight of the poor. Although FDR was a Democratic president of social welfare and seemingly socialist ideas, the idea of “modern liberalism” didn’t stick with the Democratic Party until Lyndon B. Johnson’s presidency in the 1960’s. This is the decade where there is a transformation of social ideas. Southern Democrats, otherwise known at the time as Dixiecrats, were racists and pro-segregationists. After John’s reelection, Dixiecrats, both in congress and their constituents, became frustrated that their ideas no longer aligned with the Democratic Party. This is where the major shift occurred in politics that set Democrats on the left, and Republicans on the right. Since the 1980’s conservative Reagan Administration, modern conservatives began reusing the term “neo-liberalism” to refer to the set of ideas that once benefited white men at the top, the ideas that Adam Smith talked about and the ideas that the stock market investors and bankers in the 1920’s capitalized on. Reagan was notorious for his economic policy of “trickle-down” economics which encouraged rich people to continue getting rich by tax-breaks and deregulation of enterprise because their wealth would be distributed down to the lower classes through the creation of jobs. Neo-liberalism was being used because “neo” means “new” and liberalism meant “classical liberalism,” or the ideas of free-trade, free-market, and little regulation… it was not being used to mean what we’ve adopted “liberalism” to mean today, which is more along the lines of equal rights, free public education, higher taxes, publicly funded health care, and to be less traditional. Neo-liberalism is essentially a form of classical-liberalism but focusing less on freedom of speech and more so on freedom of economic opportunity, where the richest get richer because of their privileges and the poorer get poorer because they are pawns in the economic game that the rich play.